Rare setting on a large sandy tract with 971 ft on Lake Huron in the Les Cheneaux Islands area, east of Cedarville. 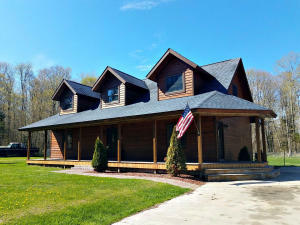 This beautiful 4BR, 3+BA cedar/log home features 3000 sq ft of living space, large enclosed sun-porch & wraparound deck. A full bsmt offers a finished game room section, workshop & bath. A real stone fireplace anchors the main living area while plenty of glass offers outstanding views of the evergreens and lake. A 3300 sf detached finished garage can offer extra living space! Sandy swimming, kayaking, horseback riding, duck hunting, snowmobiling-atv trails, it's all there! 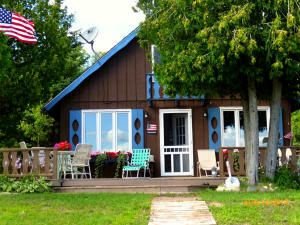 This private sandy bay area & shoreline on Scotty Bay will give you goosebumps. This is the ONLY stretch of sandy swimming in the area. A kayaker-birder-snowmobiler's, hiker's dream spot. Lakefront living at it's finest. Located directly on Lake Huron and across from thousands of acres of Horseshoe Bay Wilderness Refuge area, this custom built 3+BR, 2+BA home overlooks the big blue expanse of this Great Lake. Features inc. plenty of glass and fantastic views, ground and second level entry, main level master suite, kitchen/living area, grocery elevator from garage to kitchen, VIEWS from almost every window, living areas on 3 floors,in floor heating inc. garage floor, hot tub, hardwood flooring, custom details throughout. Choose a 1st or 3rd level office. Sprawl out on 1986 sq. ft. of above ground living and 400 ft. of ground level for overflow guests. This deep lot inc 137 ft. of waterfront & a 30 x 40 boat/storage bldg. A quick 5 minute drive from the Mackinac Bridge. Price Reduced $10,000! 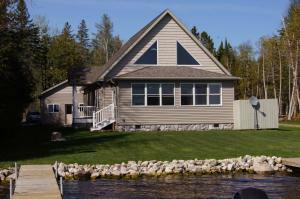 Custom Built high efficiency, yr-rd, 3 BD,3 BA, 1.5 story chalet on sandy beach of all-sports Brevort Lake. This 4300 acre lake offers great fishing, duck hunting and 4 seasons of recreation. 80% of this Upper Peninsula lake is Hiawatha Federal Forest land with thousands of acres of public use, hiking trails and more. Direct snowmobile, ATV trail system and DNR Boat Launch are right up road. A stone fireplace, drywall, warm wood trim & sunroom add to the coziness. Inc. a 3-car heated gar w/workshop, garden house, dock and 102 ft. sea wall. Crawl space (heated, lighted & lined floor) interior access. Yr-round paved maintained rd. All rooms have multiple wired cable and internet outlets, 13 min. to the Mackinac Bridge, Mackinac Island ferries and 2 Great Lakes. Welcome to Tapawingo Farm, located in the city limits of historic Sault Ste Marie. Built in 1916, this stately 2+story brick home is situated on 10 acres with a lg barn, 2+C garage, garden area & is the only horse boarding facility in the city. 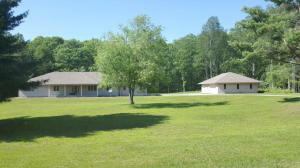 The big 4-H family has moved south and this rare property is now available offering many possibilities. Features 3 levels of living space with a stone fireplace, 1 main level bedroom, original claw foot club, french doors and original 100yr.+ details. The 2nd level features a sitting room or office with bay window and laundry room as well as 3 other bedrooms. The 3rd level features additional bedrooms and family room. Up to 7 possible bedrooms. Nice opportunity for an educational/training facility or sm. business. Possible rental. 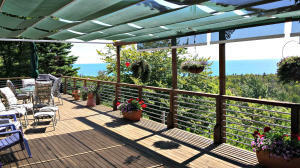 This adorable bridge view chalet-style Lake Michigan cottage is situated on 140 feet of frontage, just 5 miles west of the Mackinac Bridge. The main level features 2 bedrooms, laundry area, and kitchen/dining room/living room with fireplace & vaulted ceiling. The upper loft sleeps the overflow. Great front deck and attached outside sleeping hut with Murphy bed (reading and napping spot of choice). 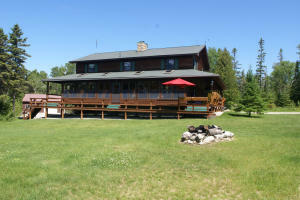 This property shouts Up North and is a great place to base all your northern adventures from. 5 min. west to Sand Dunes beaches, North Country Trails+, and 5 mi. east to historic St. Ignace/region. NEW LISTING! 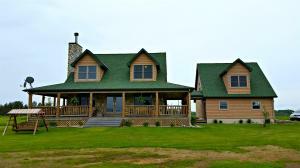 5+ ACRE RANCH HOME. Close to lakes, federal and state land. This 5 bedroom, 3 bath home has everything you need in a beautiful wooded setting. Home boasts an open concept floor plan, a chef's dream kitchen, formal dining room, tons of storage, large living room/game room with bar and attached heated 1 car garage. All these amenities in a peaceful country setting. The detached 5 car heated garage adds even more storage and is perfect for a large family offering multiple uses. There are large rooms, large closets and so much storage in the house you will never run out of room. Move in ready, call today to come and see! 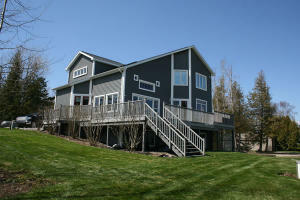 Custom Cedar frame home located just east of The Cut River Bridge & 22 min W of the Mackinac Bridge. This beautiful 1.5 story home features a 25+ ft stone fireplace, open vaulted ceilings and upper level loft bedroom and bath. 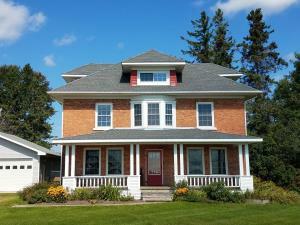 The open concept flows out to a private rear deck and fenced in back yard surrounded by woods. The front of home features over 45 feet of covered porch. Warm knotty pine ceilings throughout, hardwood floors with some tile, main level laundry, kitchen island, solid pine doors and woodwork throughout. A custom 48 x 36 ft garage features 3 doors and workshop. A paved driveway and paver bricks line the entry. 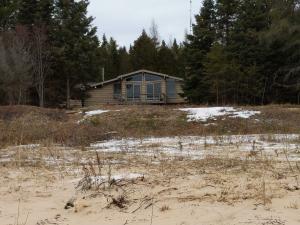 Close to the main snowmobile and ATV trails, Lake Michigan, new boat launch, public lands-hunting and fishing. Recreation abounds! Epoufette a few min away.